PRESIDENT Emmerson Mnangagwa hailed Bulawayo for taking a leading role in the implementation of devolution of power as he commissioned a $2 billion housing project and a $2 million tomato processing plant in the city yesterday. Upon completion, the Hopeville Housing Project on either side of the Joshua Mqabuko Nkomo Airport Road will build a minimum 15 000 housing unit across the social strata, a mall, schools and an 18-hole golf course making it bigger that Gwanda Town centre. As a result, President Mnangagwa has supported the idea of the project setting up its own municipality along with two other envisaged housing projects in Rangemore and Kensington and forming satellite cities to Bulawayo in line with the model of a metropolitan province. The Turning Matabeleland Green (TMG) Tomato Processing Plant on the other hand processes 150 tonnes of tomatoes a day and produce about 30 tonnes of tomato juice everyday and providing income to more than 4 000 families. Speaking during the commissioning of the two projects at the Hopeville site, President Mnangagwa invited other provinces to Bulawayo to see how imaginative its people are in terms of developing the provincial economy. “This time around we are going to institute the provincial councils across the provinces as per demand of our constitution and the task is for these provincial councils together with rural district councils in the respective areas to make sure they plan the growth of their provinces,” said President Mnangagwa. The President called on stakeholders, private and public institutions to be alive to the new philosophy of provincial economic development where provinces are expected to plan and grow their GDPs. President Mnangagwa hailed the two projects which he said are critical building blocks towards the revival of Bulawayo, the creation of decent jobs and an improved quality of life for citizens. He said the tomato processing plant was a welcome initiative as it resonates with the Government’s call for the value addition and beneficiation of agricultural produce. The President expressed optimism that the tomato processing plant will enhance economic growth of Bulawayo and contribute meaningfully to employment creation both directly and along the value chain. 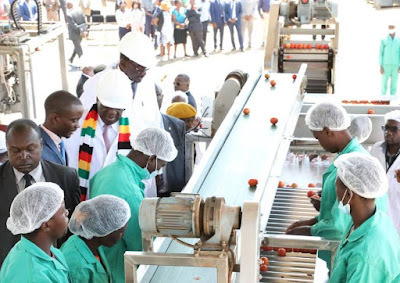 He said the tomato processing plant will positively impact on the people in both Bulawayo and the surrounding agricultural community through its out-grower scheme made up of communal and resettled farmers in the Matabeleland regions. President Mnangagwa said he was impressed to find a young manager at the tomato processing plant and the employment created for women and youths. “I’m advised that that plant has created income to over 4 000 people in the rural areas producing tomatoes and giving income to those families. That will improve the life of those people by producing tomatoes. There is no more sitting by the roadside selling tomatoes, you just produce and bring the tomatoes to the plant and you are paid,” he said. The President challenged the tomato processing company to think big and to ultimately seek to produce for export. “I have been told that they process about 150 tonnes a day and produce about 30 tonnes of tomato juice everyday but with that, they are unable to meet the domestic market and yet that same product is wanted in Sadc,” he said. President Mnangagwa said the housing project will go a long way towards addressing the housing needs of the people of Bulawayo and surrounding communities as well as contribute towards the Government’s national aspiration to provide decent housing for all. “I’m informed that a minimum of 15 000 houses will be built, there will be again a complete business centre with everything that you need. “With all that, the Minister of Local Government (Cde July Moyo) has told me that it’s now necessary to have a municipal council for the area because the size of this development will, when complete, be bigger than Gwanda in terms of the housing units that are going to be built. I said to the minister, I support the idea and this should be what must happen in other provinces,” said President Mnangagwa. “This project will equally stimulate employment creation directly in the construction process as well as along the downstream industries such as steel fabrication, joinery, timber, plumbing and electrical products among others. President Mnangagwa hailed the role played by the church in initiating the two projects through the guidance of Hamara, Hopeville, Ebenezer and Turning Matabeleland Green companies. He said the investment, funded locally is testimony of what Zimbabweans can do on their own to develop the country. President Mnangagwa reiterated the Government’s commitment to support companies which strive towards the attainment of the national vision. “We are all critical building blocks for the development and building of the Second Republic, brick by brick, stone by stone,” he said. President Mnangagwa said the Government will accelerate the country’s agenda urging all new manufacturing concerns to incorporate the latest and most versatile technologies to enhance production efficiencies, lower costs and increase output. He said there was also need for the adoption and adaptation of appropriate technologies in the agro-processing industry especially in view of the prevalence of many small scale farmers across the country. President Mnangagwa said in line with the Government’s mechanisation drive, measures have been put in place to speed up the supply of agriculture equipment such as tractors for tillage.